The weather-beaten terrain of the east coast. The hues of Plandon Cay Cut Channel. 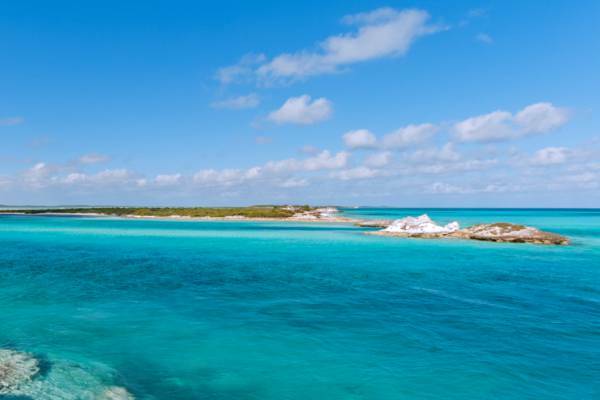 Isolated and uninhabited, the scenic Plandon Cay is found off the northern peninsula of South Caicos. The total landmass of the island is about 50 acres (20 ha), with the peaks of the cay reaching about 25 feet (8 meters) in elevation. Beautiful beaches, interspersed between low white cliffs, are located on the east and south coasts. The sounds, channels and shallows in the Plandon Cay region offers one of the finest landscapes in the Turks and Caicos. Changes in water depth and suspended limestone particles in the water create an amazing range of blue, turquoise and emerald colours. Crumbling marine limestone bluffs make up the majority of the dry ground on Plandon Cay. Nearly all rock in the country is limestone, however there is a vast difference in surface hardness throughout the islands. Coastlines such as Mudjin Harbour and the Crossing Place Trail on Middle Caicos, and Chalk Sound on Providenciales exhibit a harder grey “patina”; a weathered surface that often has intricate patterns. This hard shell typically is very thin and the rock under it is the bright white common to the country. The much younger dunes found on some Turks and Caicos coasts exposed to trade winds, including the bluffs on Plandon Cay, are much softer, and in fact often blur the line between hard sand dunes and limestone. The cays found between South Caicos and East Caicos hide exceptional kayaking spots. Teeming with bird and marine wildlife, these mangrove-lined water ways are sheltered and perfect for paddling. The adjacent Bell Sound National Park, and the creeks of McCartney Cay, Middle Creek Cay and Hog Cay are truly spectacular. Last reviewed by an editor on 4 October 2016.